How and Where to Buy Jublia Solution? CanadianPharmacyWorld.com offers Jublia Solution at the best price available online. We offer a large variety of brand and generic medications with a valid prescription from your doctor. Our Canadian international pharmacy offers free shipping on all orders to the US. If you need more information, please refer to FAQ. Are there Alternative Names for the Brand and Generic Jublia Solution? The brand name Jublia 10%/6ml solution comes from Canada and is manufactured by Valeant. There is no generic available for this medication. We also carry other Anti-Fungal medications. What Dosages and Forms is Jublia available in? 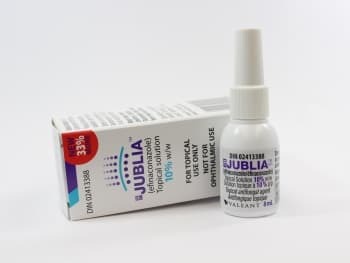 Jublia is available in the strength of 10% solution, which is available in the size of a 6ml bottle. Jublia solution is a clear, colorless to pale yellow solution that comes in a white plastic bottle with a brush applicator. What is Jublia Solution used for? Jublia solution (Efinaconazole) is an antifungal medication that is used to treat the fungal infection of the toenails called onychomycosis. Efinaconazole belongs to a class of drugs known as azole antifungals. This medication works by stopping the growth of certain types of fungus. Jublia solution works for fungal infections only and it will not work for other types of infections that are caused by bacteria. What are the Possible Side Effect of Jublia solution? Are there any Precautions or Drug Interactions for Jublia solution? You should not use Jublia if you are allergic to Efinaconazole. It is unknown whether Jublia will harm an unborn baby. Inform your doctor if you are pregnant or plan to become pregnant while you are using this medication. It is unknown whether Efinaconazole topical passes into breast milk or if it could harm a nursing baby. Inform the doctor if you are breast-feeding a baby. Jublia should only be used on nails and surrounding skin only. It is unknown if Jublia is effective in children. Jublia solution bottle should be tightly closed and in an upright position at room temperature away from children and pets. This medication his flammable, keep it away from heat or open flame. Do not freeze this medication.